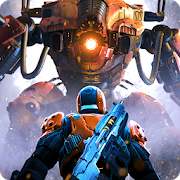 Shadowgun Legends has been updated to version 0.8.0, and this update brings a hefty amount of new features, content, and improvements. If you're unfamiliar with the title, it's a first-person shooter stuffed with over 200 single-player missions, and it also offers a wide selection of multiplayer content. It's basically mobile's version of Destiny, and with the changes brought with this recent update, players can jump into a new Capture the Flag PvP mode as well as work their way through the main campaign with their friends by their side. The most significant changes this update brings are of course the additions of the PvP Capture the Flag mode and the game-wide co-op. The CTF mode brings along a new map called Alien Cave, and there's also a new cosmetic bundle that fits with this theme. The game-wide co-op is also a very significant change since it allows players to group up and take on any of the primary campaign missions together, something that wasn't possible before the 0.8.0 update. Of course, there's even more content to expect from this update, such as four new legendary weapon types, five new emotes, plus there's a couple of new ways to earn in-game gold. For the full changelog, read below. and plenty of other bugfixes.